Participants raising their spirits by shouting “Ganbaro!” three times, demanding the removal of Ospreys on the evening of December 22 at the 21st Century Forest Park Gymnasium in Nago City (Photograph by Masatoshi Moromizato). [Nago] On December 22, the Emergency Protest Rally Demanding the Removal of the Defective Aircraft Osprey took place following the crash-landing accident of the U.S. military vertical takeoff and landing transport aircraft MV-22 Osprey at the coast of Abu of Nago City. 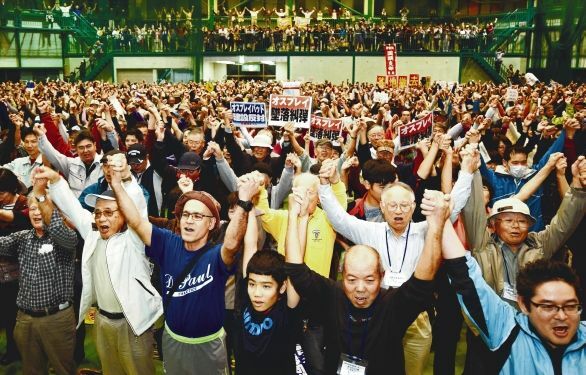 The rally was held at the 21st Century Forest Park Gymnasium in Nago, and about 4,200 Okinawans attended. Participants appealed to the public during the rally. They said that Okinawa will work with Governor Takeshi Onaga to prevent leaving behind a seed of chaos for the next generation. Okinawans will also continue to fight with the governor until: Ospreys are removed, the Futenma Air Station is closed and removed, and the construction on the new base in Henoko is abandoned. During the rally, one speaker said, “Conservatives and reformists must work as one to stop the construction of the new base in Henoko and Ospreys from flying.” Another said, “Okinawan people’s anger has reached a boiling point, and they can no longer be patient. We must join forces to confront both the Japanese and U.S. governments” Yet another said, “We will continue to fight as long as the bases exist.” Participants showed their determination toward the battle that is to come in removing the Ospreys and preventing the construction of the new base in Henoko of Nago. Six Diet members elected by Okinawa from the opposing party of the government also participated in the rally. The rally was arranged to take place around the same time as the Northern Training Area Land Return Ceremony, which was held at the Bankoku Shintryokan Okinawa Resort MICE Facility in Nago.